I wasn’t going to mention it–and it’s a good thing I didn’t as expectations would have been shattered–but now that I’ve screwed it up I can confess to attempting to post every day this month. I did it in November 2007 and 2008 though I’m pretty sure I cheated a few times and posted a day late and changed the post time. I decided not to do that this time. I’ll just post twice a few days this month to make up for it. The culprit for missing Saturday? I know, right? It was pretty awesome. 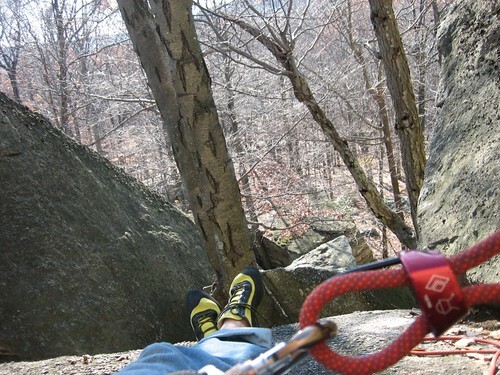 Yes, I was belaying when I took the photo. Don’t worry, the guy was on a fat ledge and I told him to wait a second while I took the picture.